“To give unlimited opportunity to seniors and those with disabilities in order to preserve their independence and prevent social isolation.” I believe this is critical to their quality of life …. AND …. providing quality service, timely reporting and meaningful conversations, is critical to their loved ones’ quality of life as well. … when you can count on someone to make sure your loved one is well cared for and taken out and about to appointments and shopping in a timely fashion; … that their wishes will be respected and their independence maintained to the degree it is safe and prudent; … AND that they are having a good time in the process!! … then you can relax and know that more than just their basic needs and wants are being met. My clients tell me over and over that they are so grateful that Mom or Dad really enjoys going out with me. They appreciate that I keep them up to date as to how they are doing, what the Doctor might have said or if they need anything provided that I can’t supply. Having been there myself, I know how difficult it can be when you don’t have sufficient time or enery to meet the needs of a failing parent. Distance, other obligations and commitments elsewhere are sometimes overwhelming and frustrating when faced with family crisis. Having someone close by who will step in until family arrives has been my priviledge in the past. 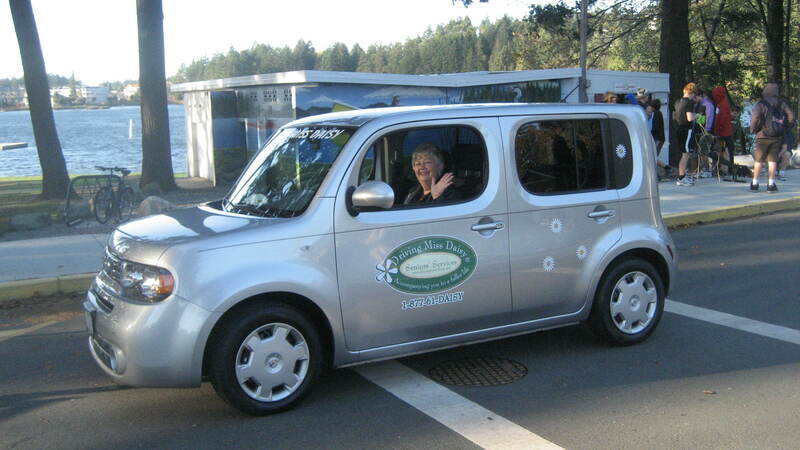 I began my Driving Miss Daisy service in 2009. I believe my previous experience as a professional driver, seniors’ advisor and energy medicine practitioner allows me a unique perspective of my clients. I hope this has been helpful for you. Please call me for further information, references or to set up a complimentary interview. I look forward to talking with you.